"After celebrating its first anniversary by passing the 35,000 app mark in mid October, the Windows Phone Marketplace has now passed the 40,000 app and games submission mark." Microsoft's Windows Phone OS has been enjoying good press lately. The Nokia Lumia 800 is selling well in Europe, reviews of the AT&T Mango phones have been good and there are numerous reports that show an increasing interest in developing for the Windows Phone OS. It's this developer interest that has pushed the number of apps in the WP Marketplace to over 40,000. Content is being added at the rate of 165 items per day with submissions in every category. 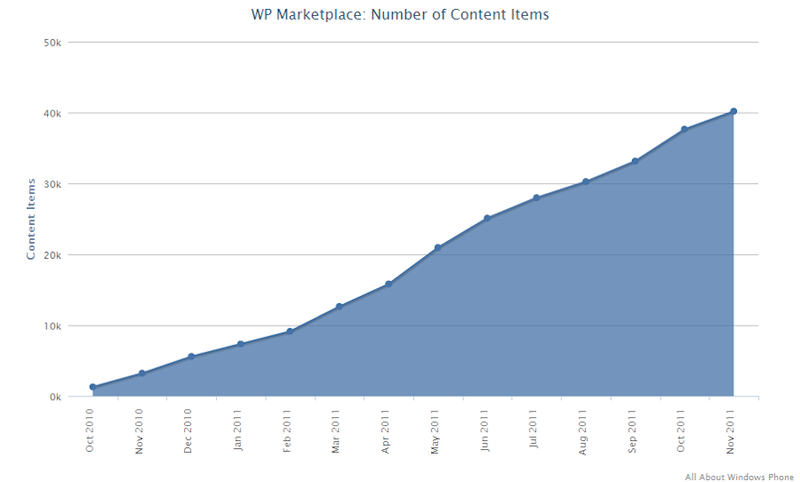 If this trend continues, the WP Marketplace will cross the 50,000 mark by mid January. Thanks to Ewan Spence for the tip.